With its Alpine background and the well-known island, Bled attracts numerous tourists from all over the world. One simply has to see it to believe in a natural beauty like this and it is a must-do for any tourist, who is traveling in the area. If one is an active researcher of natural beauties, he/she can check out the main Bled tourist attractions in a day: Bled Castle, Bled Island and Vintgar Gorge. For more and deeper research, one has to travel a bit further into the valleys of the Julian Alps, visit the Triglav National Park and drive all the way to Bohinj Lake. If you are at least a bit of a researcher, nature lover and you like to do something wild and sportive around Bled, then canyoning is the right thing for you. Canyoning is a unique form of movement through a deep and usually winding canyon, full of natural pools, rocky slides and steep walls. It is a safe and comfortable activity, which is appropriate for everyone. I remember well my first canyon exploration with my friends, which was about twenty years ago. I could not even imagine back then, that this activity would someday become so popular. 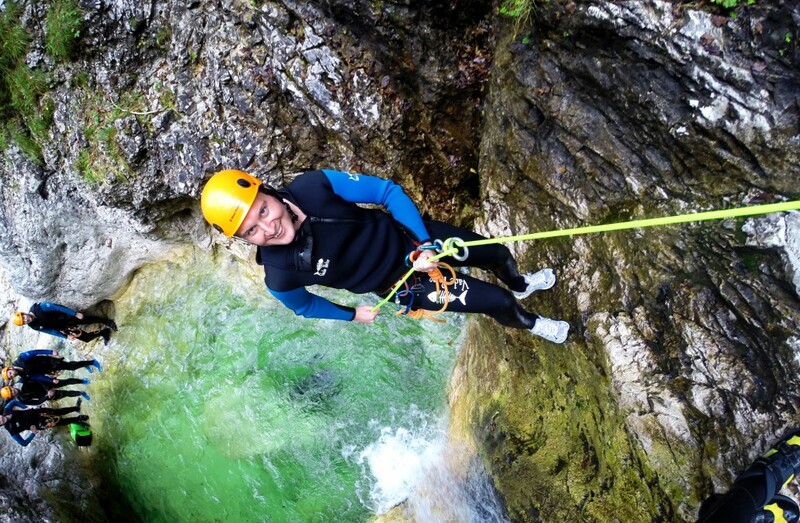 It is said now that if you visit Bled and you are young at heart you must go canyoning. I used to be a canyoning guide a few years back and I met quite a few people who came from far away places and said that they heard it is worth jumping into a canyon for some fun time while staying at Lake Bled. We had the best time and many times became really good friends. Some also extended their stay in the Julian Alps area because they wanted to see more canyons. The situation is similar today, only the guides at Life Adventures have changed, with the young generation taking over. Today, when summers are getting hotter and hotter, when everything is in abundance, canyoning in Jereka or Grmečica is the right thing to do. This activity accelerates blood flow due to adrenalin, inspires the knack for exploration and the cool Alpine water refreshes ones body and soul. 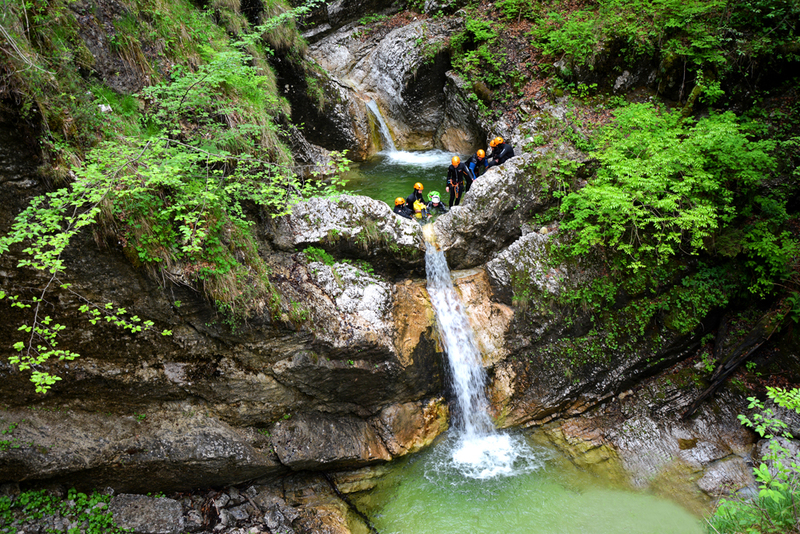 Canyoning in Grmečica is a true summer adventure for it is a natural toboggan, full of deep and mysterious pools, where one is simply in awe with the wonders of the world. The stream has shaped the deep gorge for many years into a natural toboggan. Grmečica surprises at the end with a high jump into the final pool. One can choose a platform – depending on ones courage and love of heights. Jereka Canyon is a much calmer canyon, but still worth exploring. It is less demanding, but still full of slides and jumps, appropriate for beginners or less experienced, for families and for all who wish to partake in an adventure that requires a middle dose of adrenalin. The most spectacular part of the canyon is the narrow part in the last section of the gorge. There the world is literally turned upside down and some sportive maneuvers are required in order to go through the long toboggan, which takes you down to the last pool. Bled with its surroundings has many beautiful things to offer, but the best thing to get away from hot summer temperatures and weariness is canyoning, which offers a completely new life experience. Despite the fact, that I loved to hike in the mountains and explore the valleys, I began canyoning, wandering along the water streams, relatively late. I just had to first climb so many walls and learn well the principles of alpine climbing. Descending down a canyon also demands good knowledge of swimming, as well as all needed neoprene gear and waterproof containers. Yes, it was the year 1994, when the researches of river canyons in Slovenia were reserved for the few. It stood back then that you must be a bit out of your mind, when you went in full alpine gear and diving equipment into the mysterious canyon of a stream that flew into a larger river. Today, the story is completely different. 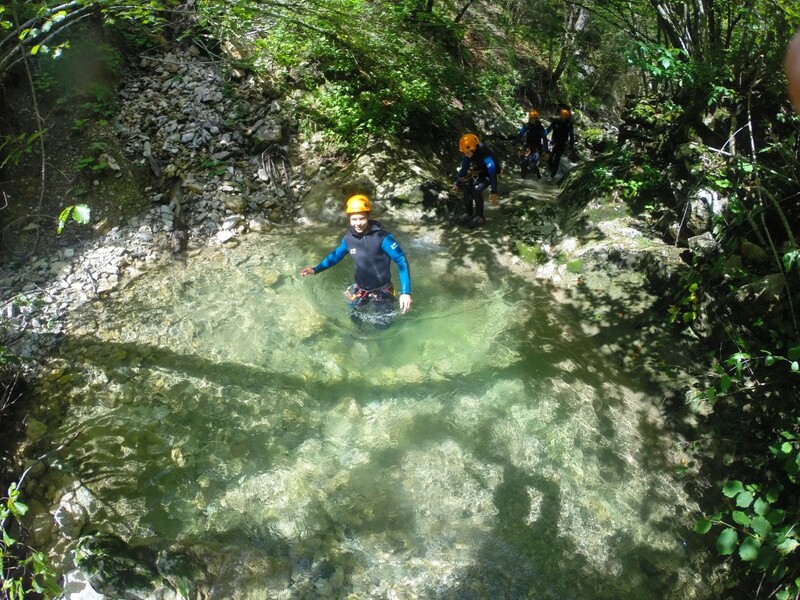 Canyoning is a recreational activity, which is carried out in technically equipped canyons and streams, which are safe and where one can predict the following events. Equipment is comfortable, light and appropriate for cooler waters. It was not like this in the past. It is typical for canyons in Slovenia, that they are located on the north-western part of Slovenia, especially in the hilly area, where rivers created magical river trails. Prevailing limestone rocks and water create beautiful colours. This is mostly so in the canyons located on the very west of Slovenia: Fratarica, Predilnica, Mostnica, Kozjak, Susec and numerous other streams that flow into rivers Koritnica and Soca. Slovenia is a paradise for safe and relatively easy exploration of canyons. Canyoning is in Slovenia one of the most popular activities in the summer time, also due to the fact that canyons are extremely beautiful, diverse, full of waterfalls and deep pools. If you are at least a bit of a researcher, nature lover and you like to do something wild and sportive, then canyoning in Slovenia is the right thing for you. Depending on the time of the year, it is all up to the water flow, which influences how much pleasure there is in canyoning. This mostly depends on the amount of snow in the Julian Alps and late summer rainfall. It is not good to have too much rainfall as well as a dry summer. Canyoning is great, if there is a sufficient amount of water. There is no better feeling than when you descend on a ten meters long natural slide and plunge into a deep pool of emerald coloured water. If you are in luck and happen to find yourself in Slovenia, a magical land on the very beginning of the European Alps, then there is no other way but to put canyoning on your to-do list. Many things can change, but especially you are filled with a good feeling, that you have done something big and worthwhile. It is worth to visit Slovenia at least once in your lifetime and descend through one of its marvellous canyons. 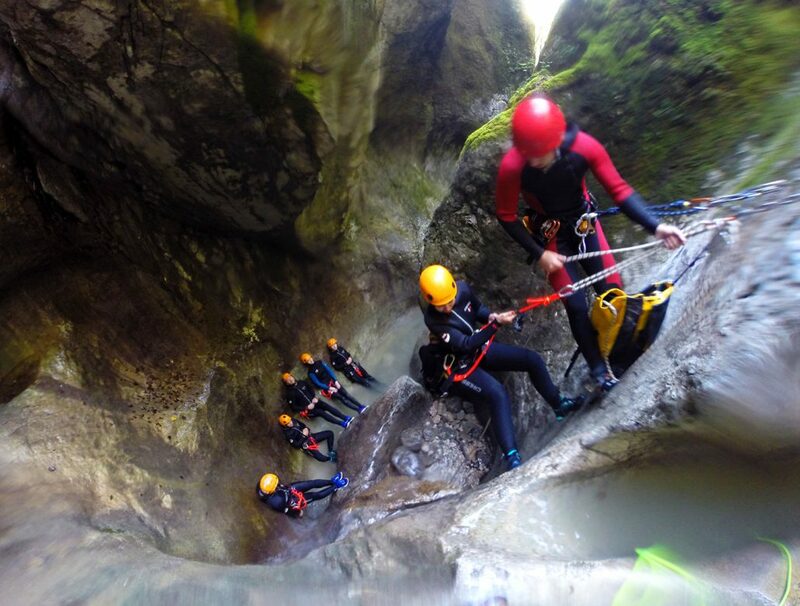 Canyoning is the ultimate adrenalin adventure. Leaping off waterfalls, sliding down rocks and experiencing forest and river areas that few ever get to see. The fine art of canyoning uses every part of your body and requires all kinds of skills – scrambling, climbing, jumping, sliding, abseiling, swimming and shouting “yeehaa” as often as you dare. It’s a wet business, but you’re equipped with a tough wetsuit that provides warmth and a certain amount of padding (rocks can be sharp). Under the watchful eye of your guide, you’ll make the journey down natural rock canyons, water-polished chutes, waterfalls, pools and streams. 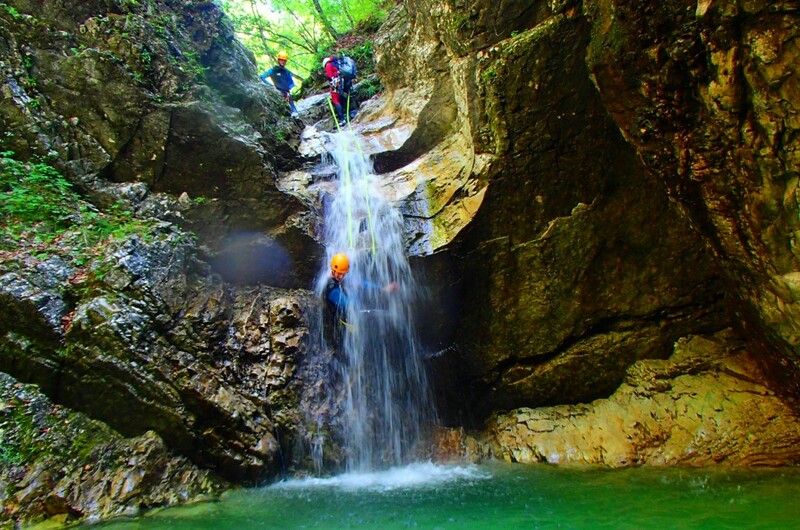 Canyoning is today one of the most popular outdoor sports in Slovenia that you can do. Because of the height differences, it creates waterfalls and pools of water. The steeper the canyon, the higher the falls. Most canyons in Slovenia are slightly more narrow and have more height. If there is water in it then it can go down a lot harder and it can be more fun. Every single canyon is unique and every trip is different, because the only certain thing in nature is its constant change. 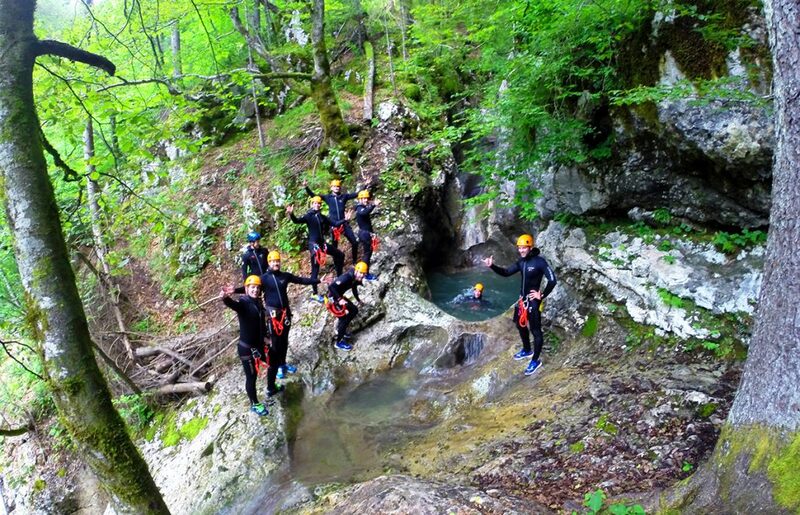 Slovenia is the perfect place for real canyoning time. 2016 Canyoning Season in Slovenia was Great! Canyoning in Slovenia is one of those activities, which offers an excellent dose of summer adrenaline and exploration, all dependent on the weather, temperatures and water level – its power and height. The best feelings while canyoning are those, when you feel safe in a cool canyon, with a sufficient amount of water running by you and the summer day out there is hot as usual. 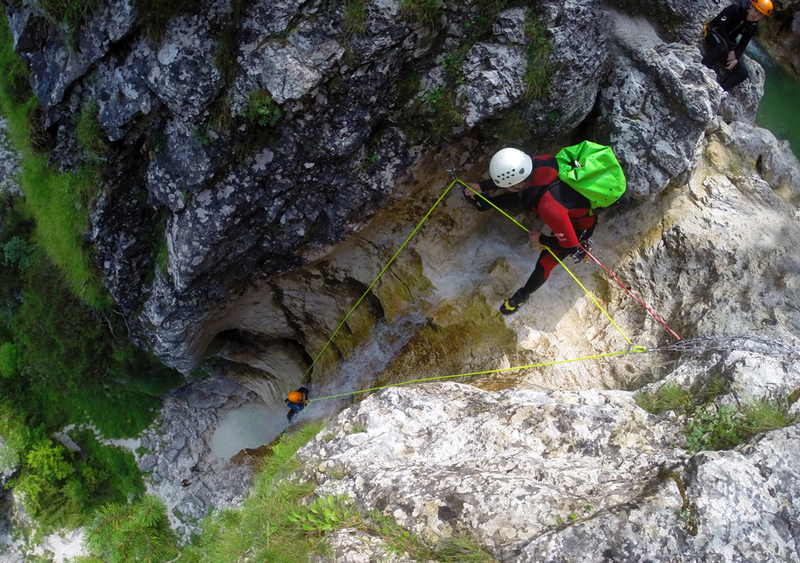 Well, this is exactly what was happening this year in the canyons of the Julian Alps and in the Triglav National Park, where most of our canyoning takes place. This summer is considered as one unforgettable season, for it was excellent for canyon exploration. Hot summer days, good amount of water and stable weather, without those typical afternoon storms. This is why we were enjoying ourselves in the canyons almost every day and several times per day as well. We have mostly visited Fratarica and Predelica Canyon with our guests, the two canyons that lie in the western part of Slovenia, as well as Kozjak Canyon at Kobarid and Sušec in the Bovec area. 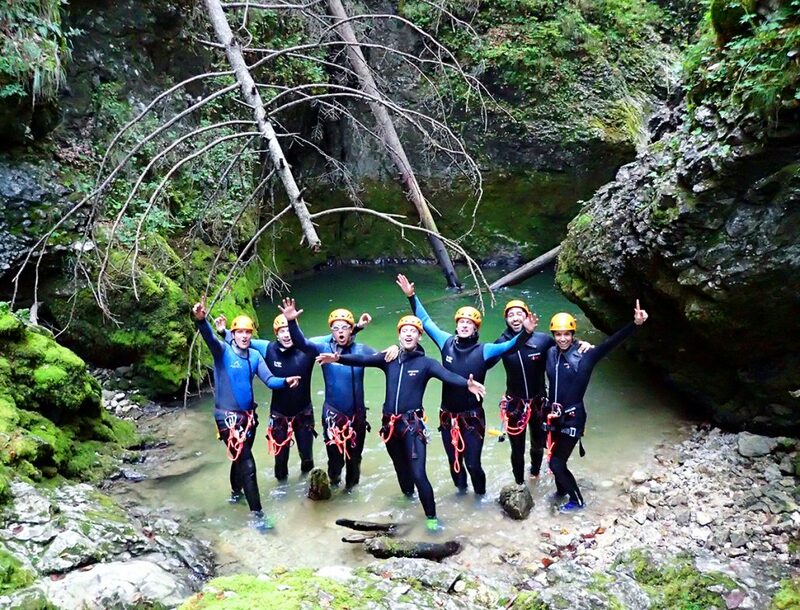 We have researched a lot and enjoyed the pleasures of canyoning in the “jumpy” Grmecica canyon in Bled area and easy level Jereka canyon close to Bohinj. This summer was truly a canyoning bliss and our guests enjoyed the true form of exploring the marvelous and pure tributaries of Soca and Sava rivers. We are proud to have thrilled over a thousand guests and to have safely carried them through numerous canyons in Slovenia. Our guides have shown the greatest measure of professionalism, we have strived to be the best and to offer the best “grip” and pleasures, use the highest quality equipment and use the natural resources to the greatest extent, offering unforgettable and avanturistic stories. Slovenia is full of small pearls – experiences and canyoning is absolutely one of the most beautiful ones and certainly most adventurous. https://www.lifecanyoning.com/wp-content/uploads/2016/10/life_canyoning_slovenia_logo_2016_01.jpg 0 0 Matej https://www.lifecanyoning.com/wp-content/uploads/2016/10/life_canyoning_slovenia_logo_2016_01.jpg Matej2016-11-05 07:12:082018-12-08 21:25:452016 Canyoning Season in Slovenia was Great! 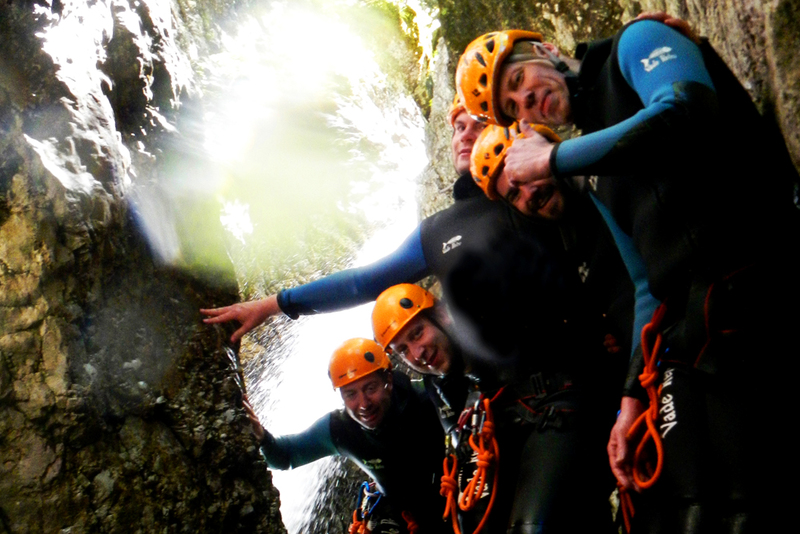 What is canyoning all about? Regarding the fact that canyoning is on the must-do list of everybody who searches for new challenges, it makes me think. »What makes canyoning so unique and special?« Are there more things connected with adrenaline like high jumps, slides and big vertical walls, cascades or there is more the nature factor, peace, amazing pure water and exploring beautiful mountain streams. I came to a conclusion that canyoning is not only both, but is and can also be adjustable or so called custom made. We can say that people can find in the same canyon totally different goals and experiences. Canyoning in Slovenia has big diversity of elements. Some are vertical, some aquatic, some offer views on Triglav National Park and high mountains, some have big jumps and some are small and easy. That is why there here are canyons for small children and canyons for big adventures. We can say to all canyoneers, tourists and explorers of the water world, that canyoning gives us the feeling of freedom and exploration, the wild part of us that started to fade with today’s modern way of living. 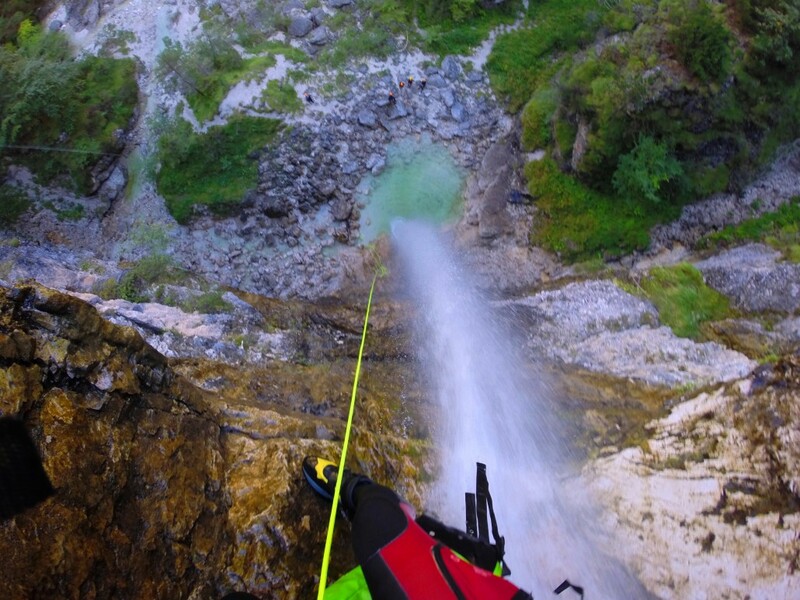 So is there more adventure or action in canyoning? There is no correct answer, we can only say that you have to try it and see for yourself. https://www.lifecanyoning.com/wp-content/uploads/2016/10/life_canyoning_slovenia_logo_2016_01.jpg 0 0 Borut https://www.lifecanyoning.com/wp-content/uploads/2016/10/life_canyoning_slovenia_logo_2016_01.jpg Borut2014-12-22 21:29:112018-09-21 06:45:20What is canyoning all about?